Heavenly is back in effect Friday 1st of August, entering the Danceteria with special guests HUERCO S. (US) and MADTEO (ITA/US)! Whilst having a diverse set of releases on Opal Tapes, Future Times and LP released on Software records, Huerco also penned the initial release for Proibito records (owned by close friend Anthony Naples) under his alternate self ‘Royal Crown of Sweden’. On the other side of the ring we have the Italian born Sextags mania/Wania affiliated, Lofi Rap collaborator Madteo. 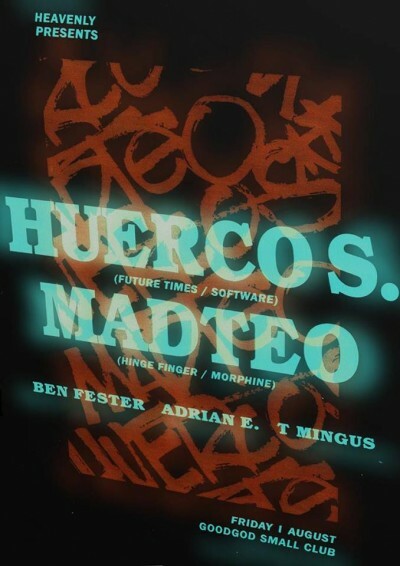 Having put forward releases through Workshop, Morphine, Hinge Finger and shäkö Records, Madteo works within a more experimental set of textures. As usual, Heavenly strong men T Mingus, Ben Fester and Adrian E will be setting the tone for the night, so get in early & stay till late as these fully decorated late night operators take you there.